It’s home buying season within the Los Angeles and Orange County areas and residential electrical inspections are on the rise. For home buyers and Sellers that means it’s necessary to hire an inspector to check your building from the roof to the foundation. Visually there are many parts of a home you can check yourself. One of the most important parts of an inspection is inspecting the electrical system. If a home is over 40 years old, recently renovated, or bought or sold that means it’s time for a complete electrical system inspection by a certified home inspector. Another time to also have an inspector check the electrical system is when adding new appliances. When inspecting older Los Angeles homes and Orange County buildings that have had many owners finding upgrades to the electrical system are common. The homeowner themselves or a hired handyman usually make the changes. The downside to this is that when doing upgrades yourself or using third parties code violations happen. If a home has a code violation the selling of the property becomes an issue. Modifications to junction boxes and wall outlets often don’t meet the strict standards set by the electrical safety foundation. In the end, it’s best to hire an expert to check the home. That will save time and cash for when of times when a repair or correction. Issued reports come after an entire home inspection and this is a must. Don’t let a less than pro look at your house. 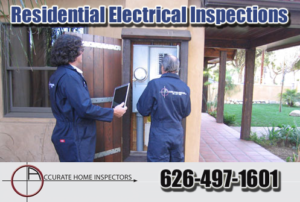 Our Orange County and Los Angeles area certified home inspectors not only look at the electrical system but also check the entire home. The plumbing, foundation, roof and other areas need looking at. The main task when doing an inspection is to make sure the home is sound. By checking all from top to bottom you will know your covered. Within the electrical system, checking all boxes and conduit bodies plus wiring methods is vital. Lots of times reported issues are beyond what the eye sees. For a pro to look at your home let us help. Before you buy or sell give us a call and let us help. We love what we do and it shows with each detailed report. We’re here to make sure your property’s checked right from the roof to foundation. 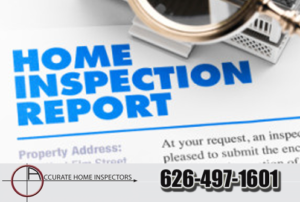 Based in Pasadena, our company Accurate Home Inspectors has been offering certified inspections for both residential homes and commercial buildings for 40 years.